Canada prides itself on religious pluralism. It is the belief that all religions are not only of equal value, but even equal validity. Under a pluralistic worldview, no one religion should have claim a to exclusivity. The Canadian Charter of Rights and Freedoms guarantees freedom of religion, and I wholeheartedly support and would defend that right. It does not however, somehow guarantee that all religions are of equal value. For example; although one is free to practice Satanism under the Charter, for many of us this would be regarded as not only an inferior religious choice, but a dangerous one. We need pagan’s invoking the power of Satan upon our landscape about as much as we need nuclear weapons on the hands of crazed world leaders. It is not as unrelated an analogy as it sounds. Religious pluralism in the early days of our nation was not much of a problem, as most immigrants came from European countries that were either Catholic or Protestant in faith. Though the two groups have not always got along, at their core they shared common values… things like the value of marriage, the sacredness of life and fundamental human rights for ALL. Today most immigrants come from non-European nations, places with cultures and religions that are sometimes inconsistent with our aforementioned core values. For the record I welcome new Canadians and think we are richer for it. My bigger concern is that our version of modern pluralism is an invitation for colonization not immigration. There is a big difference. Immigrants come to be part of a new culture, to learn the ways of their adopted home, to integrate and assimilate into society— which does not require relinquishing their heritage or forgetting their roots. I am sure we all feel Canada is a better place for Ukrainian perogies, English soccer or Scottish highland dancing. Colonists, by contrast, bring their culture with them and live under their own laws. Their loyalties lie elsewhere. The Organization of Islamic Cooperation which represents 56 Muslim countries and the Palestinian Authority has outlined a very clear strategy for the colonization of the West They are encouraging widespread immigration into to Western countries and resistence to assimilation. The explicit agenda is to over time gain control of the institutions of the West, eventually transforming them into Islamic states. “This strategy should be targeted at providing the necessary conditions for individuals from the Muslim communities to occupy the key positions within host societies, in the economic, cultural, political or information fields.” Don’t believe it? Go read the document for yourself. Many European countries are already getting concerned. Because of the extraordinary Muslim birthrate there are fears that some countries will have a Muslim majority by 2050. Politicians have become alarmed that they could end up as Islamic states. 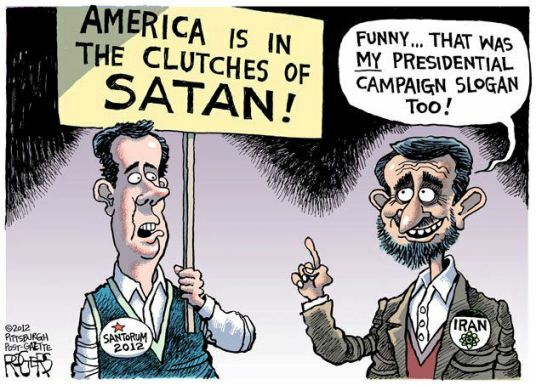 Radical Muslim groups have made it clear that that is their goal. At any rate the political battles are already well under way. 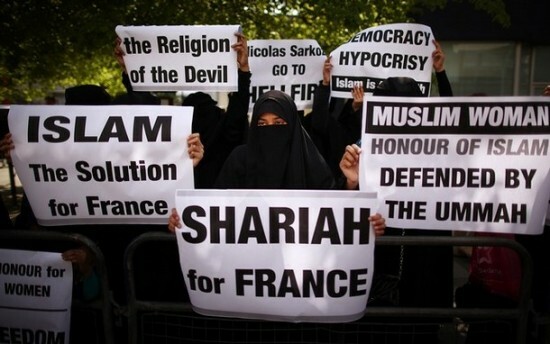 France has been the first country to ban Muslim head coverings in public. Belgium has a similar law, which on hold at the moment. A Swiss referendum called for a ban against building Muslim minarets I do not want to be an alarmist but I think it is a fair question to ask, what will Europe look like in the future… and can Canada and the US be far behind? Presently we have already started wresting with the surface questions. Veiled Muslim women can vote without showing their real identity and for years they were able to slide through airport security without showing their faces. Now at Canadian airports, covered Muslim women must lift their veils, although they may opt to show their face only to a female security screener. As of last December their faces must be clearly seen when reciting the oath of citizenship. There was a significant backlash against this ruling claiming it was a limitation to religious freedom. The fact is, the Quran nowhere requires women to wear a burqa or niqab. These are cultural customs not religious. Personally, I believe people can dress however they want, and if it doesn’t effect national security, I am even happy to accommodate some of their special requests. For example I have never had a problem with the notion of a Sikh man who wears a turban being a member of the RCMP or military. 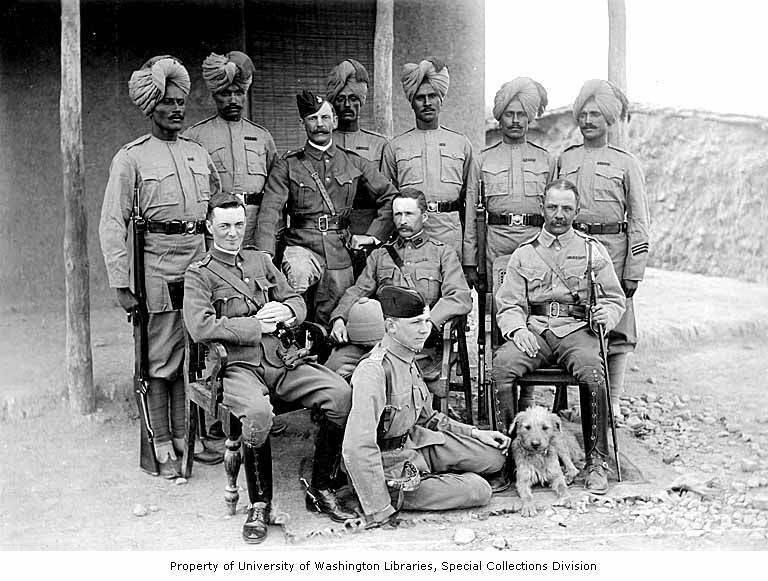 After all the Sikhs fought alongside the British for decades and the difference of headware was never even an issue. It is the issues below the surface that concern me. Pluralism in Canada suggests that we should embrace their traditions on an equal footing to our own Judeo-Christian roots. That is where I need to get off the bus. We are beginning to see where pluralism might lead us. Most would regard the ‘honour killing’ of four women by Mohammad Shafia, his wife Tooba Yahya and their son Hamed as an isolated indecent. This is what many of us don’t get, Shafia would not have seen what he did as wrong. In fact, just the opposite. This educated and successful man would have regarded what he did as virtuous. In his mind his daughters and his second wife (yes, he was a polygamous as well) had dishonoured his ‘good name’… so he killed them. As Westerners we are hard pressed to understand this. How could a parent’s honour be more valuable than a human life? Under Sharia law a woman’s life does not have near the value of a man’s. A daughter’s chastity is regarded to be the property of her family, not her own. So any shame brought to the family should be dealt with with extreme prejudice. In many Islamic states it is not even a crime. In Syria, Morocco, Brazil, Colombia, and other countries in the Middle East, Africa, Asia and Latin America, men are permitted to kill female relatives in honour killings, as long as it was a crime of passion and not pre-meditated. In Syria, even if convicted of a pre-meditated honour killing (which almost never happens) the sentence is only 2 years in prison. Even though the UN claims there is 5000 honour killings a year worldwide, in reality there are that many every year in Pakistan alone. In India 5000 Hindu women are murdered every year by their husbands simply because their dowry was not big enough. It is estimated that 1000 women lose their lives every year in the US through honour killing. Canadian Islamic groups have condemned the Shafia killing, as they would and should. By sentencing them to life in prison our justice system has sent a clear message that this kind of behaviour will not be tolerated in the slightest. Which is a good start. What does concern me is the importation of this kind of twisted, backward and treacherous worldview in the first place. Canada may need to rethink our concept of pluralism. Don’t misunderstand what I am saying, I still support leaving our doors open to immigrants from around the globe. However new Canadians need to be expected to adopt our historic Judeo Christian values of the sacredness of all human life. Immigrants that are convicted of human rights types of crimes should be deported after they serve their sentences. We cannot allow insidious religious or cultural mindsets to creep into our nation under the guise of religious pluralism. A lot more thought and action needs to go into how we handle our immigration and citizenship.